Jamaica, at over 4,200 square miles in size, is a remarkable island located in the Caribbean. It is a unique destination with a fascinating past. It has an equally modern and vibrant culture that is experienced through the food you enjoy, in buildings and place names and especially through its people. 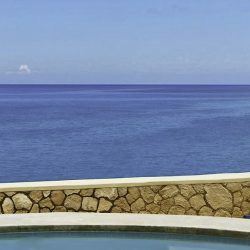 As you contemplate which of these delightful villas in Jamaica you will choose for your vacation, let me give you a short tour through some of the celebrated attractions to this Caribbean paradise. The capital of tourism in Jamaica is absolutely Montego Bay or MoBay, as the locals like to call it. If you are basing yourself at one of the spacious private villas near this lively town, you will find beautiful beaches, restaurants, bars, an amusement park, snorkelling and diving within the protected Marine Park, all on your doorstep. Emma, our Jamaica villa expert has written on some of the best things to do in Monetgo Bay. If, for you, the highlight of any vacation is a round or two of golf, you can find White Witch, Cinnamon Hill and Half Moon golf courses within a very short drive of MoBay. 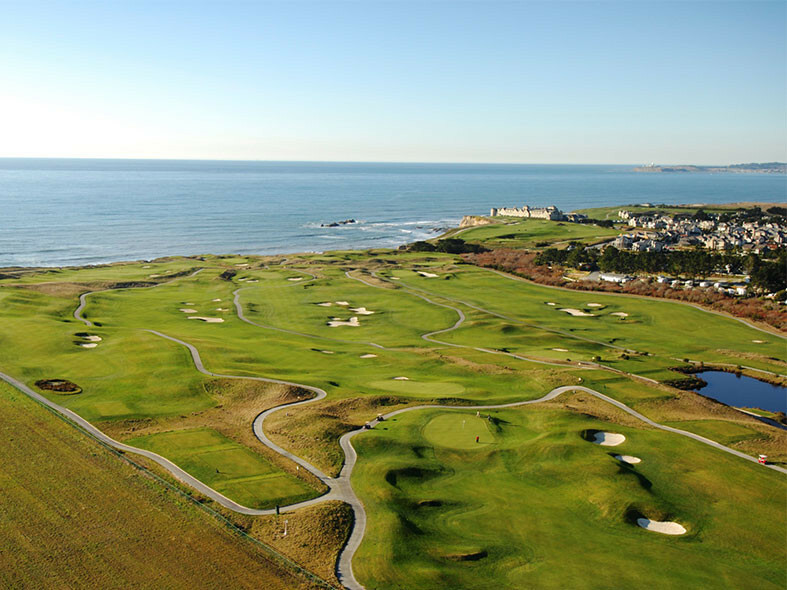 The beauty of the views across these courses will play havoc with your game, though, as it’s quite impossible not to be distracted by the spell-binding scenery along this coastline. If any of your group are, shall we say, utterly bored by the prospect of chasing a little white ball around this heavenly island but want to enjoy some quality relaxation while you are preparing for The Masters, then let me recommend you take your game to Half Moon golf course. While you chip a point or two off your handicap, your more sedate comrades, can slink off to the heavenly spa and indulge in some delicious pampering. You can reconvene after your morning of activity and see which one of you has gained the most from your separate experiences! A lush and tropical hinterland awaits you a short drive inland from Montego Bay. The busy and buzzy town and its environs gives way to a wild, untamed countryside that offers visitors an opportunity to enjoy nature at its very best. 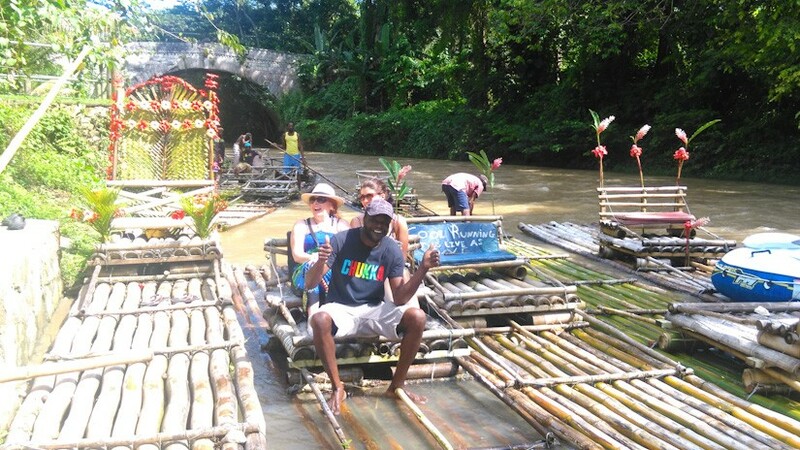 One of the most fun things to do in Jamaica is to take the Martha Brae Bamboo Raft river tour. In a guided trip of about 90 minutes, you and your partner will sit like kings in your bamboo thrones on top of these stable, flat-bottomed rafts. Our pilot George guided us gently along the river, regaling us with some fantastic stories about the area as well as giving us wonderful local knowledge about flora and fauna. I really wished we could have pottered around on our bamboo raft for longer. Such a relaxing experience. It’s lovely getting so close to nature but having to endure very little hardship while doing so! I really recommend this as a must do in Jamaica. There isn’t a pun or witticism in the world that hasn’t been exhausted about this unique Jamaican cooking term. I am not going to make reference to any of my ex-boyfriends or make any asides like ‘you are what you eat’. It would be far too puerile. Instead, I am going to attempt to describe what Jamaican jerk cuisine tastes like in a few sentences. So here we go …. 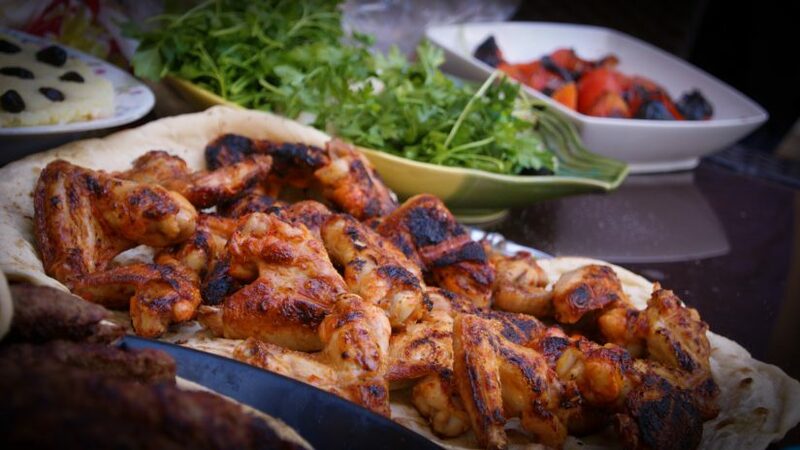 spicy, smoky, meaty, ideally eat with your hands so you get to lick the full greasy splendour from your fingers. Go to small family-run shack-style places where someone’s amazing grandmother prepares this food in the most authentic way possible. Leave at home any preconceived ideas you might have about jerk. Forget those commercial jerk spice rubs you’ve bought in that swanky supermarket back home. They are pale imitations of what is, in reality, the explosive sensation of eating a lip-smacking cuisine that has evolved over centuries. Grab some jerked chicken with a side of rice and peas and you are tasting Jamaica! One of my favourite places to visit for a plate of jerk is 3Dives in Negril. This family run restaurant is the most laid back, casual place to enjoy not only jerk but some fabulously fresh seafood. Granny’s Sauce on the side is a closely guarded secret and adds a mouth-watering addition to one of Jamaica’s national dishes. Sitting outside with a pretty view, there is always a great atmosphere here. Live music on Tuesday adds to the party vibe. If you leave Jamaica without having the jerk experience, it would be like a trip to the beach without a swim. So dive right in to one of the top things to do in Jamaica and experience a taste sensation like no other! “How do I love thee? Let me count the ways” … This could really be the rhetorical question you ask yourself as you lounge by the private pool of your Exceptional Villa. Of course, I have borrowed this poetic line from the famous Elizabeth Barrett Browning. If you want to travel back to Jamaica’s colonial past, you can visit Greenwood Great House. Mrs Barrett Browning, herself, never lived at this property but this well-preserved, fully furnished museum house was the Barrett ancestral home on Jamaica for many centuries. 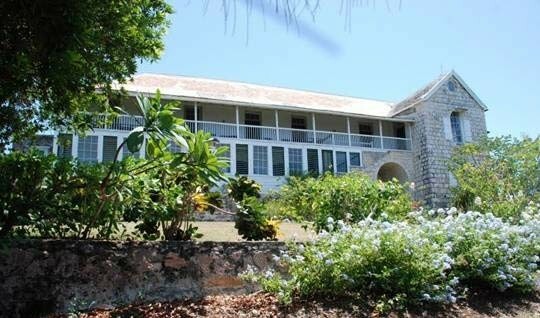 Another plantation museum to visit on Jamaica is Rose Hall. This beautifully appointed Georgian style mansion offers visitors a broad-ranging tour that takes in the history of its sugar plantation and slave ownership. As well, there is a rather gory history about a white witch, known as Annie Palmer. Mrs Palmer was said to have murdered three husbands. Quite a busy lady, it seems. According to the legend of the house, she is still at work haunting the property and sending shivers down the eager spines of visitors who take the Haunted House night time tour! 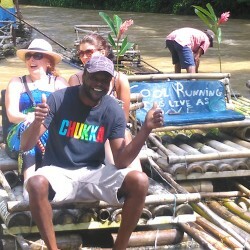 This is one of the most unusual tourist attractions in Jamaica and very entertaining. If you go to France, you will most likely visit some of the greatest vineyards in the world. If you get to the Scottish Isles there are distilleries of some of the most celebrated whiskey brands. Once you are on Jamaican soil, the globally renowned beverage of choice is rum. The heady, warm, golden tones, much loved by pirates and princes, is distilled to perfection on this island. There are various rum tours to be enjoyed. I’ve been privileged to try a few but I can, without doubt, vouch for the overall experience to be had at Appleton Estate. This is considered the oldest fully-working sugar plantation and rum distillery in Jamaica. On the edge of Cockpit Country about a 90 minute drive from Montego Bay, you will be transported through the incredible world of rum manufacture. Appleton Estates operates at the highest level and is a modern and innovative distillery. With some of their exceptional rums aged to 50 years, the product they produce is world-class. Your trip to Appleton’s will allow you to do some very authentic Jamaica sightseeing as you travel through the very unspoiled county-side that leads to this inland treasure. 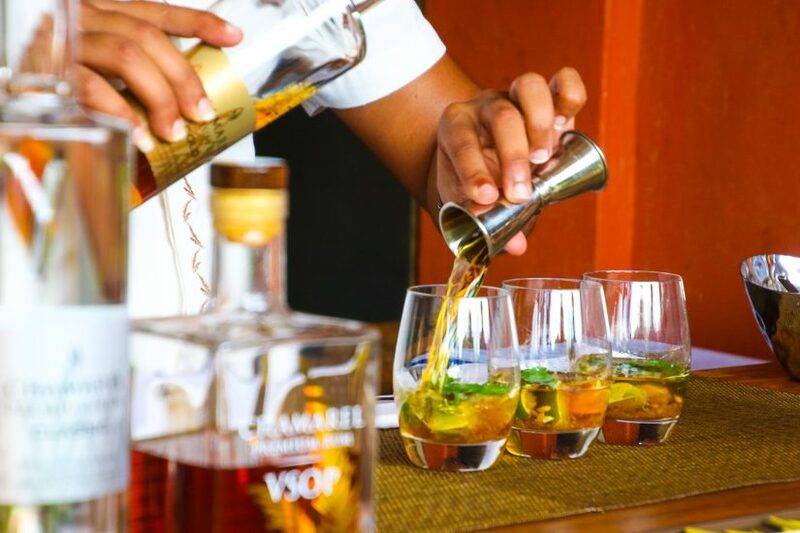 The tasting experience at the end of the tour will offer your palate a rum taste like no other. Ensure you aren’t the designated driver for the journey back to your villa! The tropical climate of Jamaica creates the perfect conditions for cultivating some of the most exotic fruits in the world. If, like me, you live in a cool, North European location, the opportunity to see tightly packed bunches of bananas and pineapples flourishing in their natural habitat, is one not to be missed. Sun Valley Plantation, a family run botanical farm, offers informed and delicious tours through their vegetative Eden. 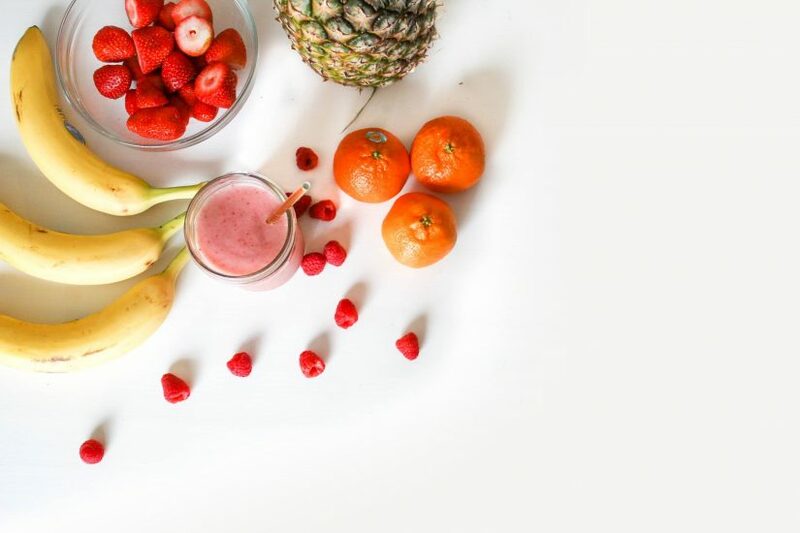 Did you know that Pineapples are actually groups of small berries fused on a single stalk, so are actually considered a berry. The same is true of the banana. Who knew? Pineapples are native to Jamaica but bananas were brought from Asia by the Spanish sometime in the 16th century. It would be impossible to think of Jamaica without the ‘yellow gold’ that is the banana. In its plantain state, it forms the basis of some of the famous and traditional cuisine of this island. In a way it’s like the potato to us NW Europeans – an interloper that has become the foundation stone of our daily diets! Sun Valley’s tour was informative as it was pleasant. This working plantation has so many species of plants, fruits and spices. The medicinal and health properties of these plants are explored during the tour followed by a delicious feast of seasonal natural goodness. It’s one of the best things to do in Jamaica. Yes, Christopher Columbus discovered the New World but it wasn’t until his second voyage that he visited the Jamaican shores. In 1492, Christopher Columbus, an Italian sailing under a Spanish flag, had gambled on the expedition of a lifetime and headed off due West from Europe to find a westward route to Asia. Believing that the land he sighted in the Caribbean was in fact India – the islands became known as the West Indies. And the indigenous people known as Indians. So much for his geographical guess work! It was on 5 May 1494, during his second ocean crossing that he discovered Jamaica. To this day, there is a dispute over whether he came ashore in Discovery Bay or St Ann’s Bay but history does tell us that during his fourth voyage his ship had to shelter from bad weather in Jamaica and he was stranded in St Ann’s Bay for over 6 months. The history surrounding the conquest by Spain of this new and magical world is rather grim stuff. The native Taino tribes were enslaved or wiped out by diseases that had crossed the Atlantic with the sailors. Spain continued to control Jamaica for many years until Britain took control. As you travel around the island, you will be greeted with the Christian legacy of the early Spaniards. Churches and place names like Ocho Rios and Port Antonio, call to mind this Spanish legacy. The British stamp followed and the island is divided into parishes each with a capital town. This is a very British concept. With places like Kingston, Falmouth and so forth echoing the towns back in England, there are still very strong links between its Commonwealth mother and itself. During the colonial era, when significant manpower was required to plant, maintain and harvest the vast sugar plantations on the island, workers (and oftentimes slaves) from African nations, India and China were shipped to this island to toil ceaselessly in harsh conditions. Sugar doesn’t seem so sweet now, knowing how the early product into the European markets, came at the high price of human suffering. The legacy of all of these races mingling on this Caribbean island is that today we have a nation of people who can claim to derive from African, Spanish, British, Indian, Chinese and other races. Jamaica revels in its varied and diverse heritage by adopting the inspiring motto “Out of Many, One People”. As a nation, it could teach us a great deal about integration – different religions sit peaceably side by side, individuals with different racial heritage all unite under the Jamaican flag as a nation of one people. Very impressive. Jamaica is probably the most popular of the Caribbean island destinations. 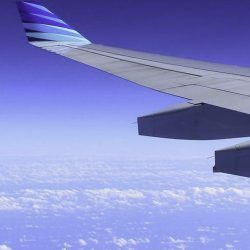 It’s no surprise that its fame as a welcoming and warm nation continues to woo generation after generation of new visitors who come in search of the essence of Caribbean courtesy and relaxation. 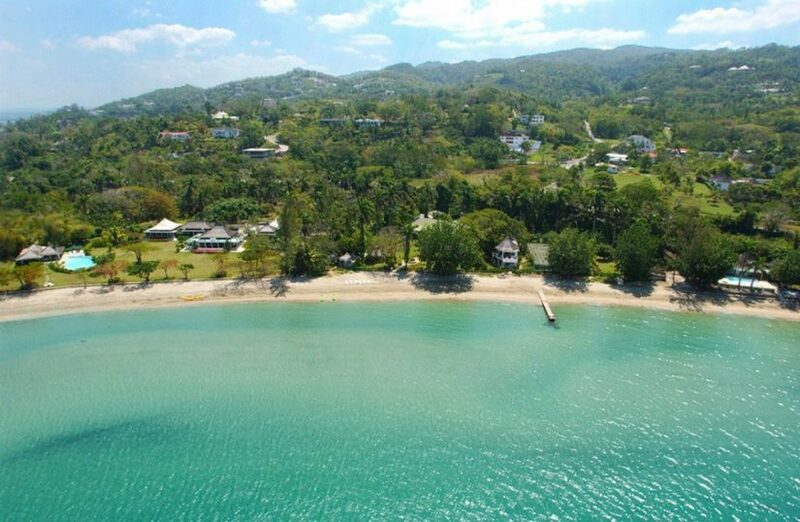 This enchanting land is an ideal location to plan your very special wedding, with many of the properties being designed as wedding villas in Jamaica. The glorious beaches, the vast tracts of unspoiled tropical rainforests, waterfalls, mountains – so many Jamaica activities to choose from. From reggae to Rastafarian culture, salt cod to jerk chicken, old colonial houses to modern plantations, Jamaica is a ripe, flavourful, spicy package that allows visitors to create unique and memorable experiences as they travel through the centuries of Jamaican history. Layer by layer, Jamaica reveals its story while at the same time showing its new and multi-cultural face: a face that is both beguiling and smiling. Come see for yourself, you won’t be disappointed!